This coconut chicken curry recipe is simple, delicious and I’ve made it tons of times for a quick weeknight meal. I’m totally in love with this recipe I made up for a simple chicken curry. I love it because I can make it fast, it’s FULL of flavor and it’s even Paleo, Keto and Whole30, depending on what you serve it over. The sauce is so good you don’t even miss the carbs! Plus, it has a lot of healthy vegetables and no sugar and the spices totally make it so you are so content with all the flavor that you don’t even feel like you’re on any sort of special diet. 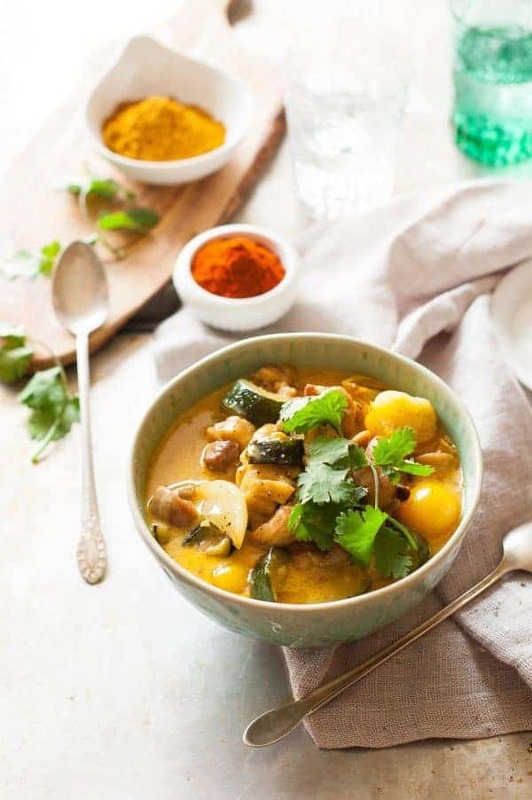 This a quick, flavorful recipe for coconut chicken curry, made with zucchini, yellow grape tomatoes, and onion. This Indian-inspired dish makes a great meal when combined with basmati rice, cauliflower “rice”, brown rice, quinoa or even nothing, depending on your diet. This recipe really needs to be cooked in a skillet/frying pan. I’ve tried it in the oven and the crockpot and it’s just not the same. You don’t get the caramelization you get from the skillet – just make sure you have enough oil so it will caramelize. When you use this method, you get a lot of flavors and can eat it like a soup if you want. My children all love this dish and it’s their second favorite Indian dish that I make, but the Chicken Korma Coconut Milk dish I make is their all-time favorite Indian dish. I make both this curry and the korma pretty spicy and they like it that way. My 4-year-old girl say things like, “It’s spicy, mom, but I like it anyway.” as she tries to find something to cut down the spice. Are my children unusual that they LOVE Indian food? You could totally add some white potatoes to this recipe. I personally don’t like them in this recipe but they are pretty traditional and if they are on your diet, you may enjoy them. I do like how they soak up the sauce. You CAN substitute chicken breasts or tenders if you really want to but I really prefer chicken thighs in this recipe because they get so tender and the coconut milk does a good job of breaking them down and chicken breasts can dry out easily. Just watch the chicken breasts carefully and lower the cooking time and you should be good. I highly recommend the Spice Hunter curry brand. It’s not always available on Amazon but there are several stores in our town that carry it so I thought you may want to see what it looks like. It’s totally worth some effort to find. Their brand is always fresh and has so much more flavor than other brands and their curry blend is so good. If you’re not afraid of a little heat, don’t hesitate to add a little cayenne pepper along with the spices. If really prefer grape tomatoes in this dish. Just dicing a regular tomato is definitely not the same. It can be served with a side of your choice – such as rice, quinoa or mashed cauliflower. It’s also good on its own like a soup. This traditionally has potatoes in it, but I like them out since I pretty much hate all potatoes. I would think a yukon gold would taste the best with this recipe. That’s part of the reason I added the other veggies in, so it wouldn’t just be chicken with sauce on it. A little fish sauce is good with this. I don’t like it sweet, but if you do, you could add a little pure maple syrup. Indian food is comfort food for me and like my Indian food HOT. If you do too, please feel free to add some cayenne pepper. Oh, I’m just getting into hot sauce. I should try some of that on this . . . Please let me know if you try this recipe and if you have any favorite ways to eat it. Do you like your food spicy or mild? What do you like to eat with your coconut chicken curry? This only a few ingredients a few simple steps. It’s a delicious, quick weeknight dinner. Heat the olive oil in a stock pot to high heat. Add the chicken and cook until chicken pieces are browned on both sides. Remove the chicken from the pan and set aside, keeping the remaining oil in the stock pot. Add the onion and zucchini and saute until lightly browned. Add the garlic, curry powder, paprika, and salt and saute for 30 seconds. Add the chicken back into the pot, along with the coconut milk. Bring to a boil. Reduce heat to a simmer, cover the pot with a lid, and let simmer for 30 minutes, or until chicken is tender. Add the tomatoes to the pot in the last 5 minutes of cooking. Serve in a bowl with the coconut broth, like a soup. Top with cilantro. Followed the recipe exactly with a little added cayenne pepper as suggested and it was Delicious! The grape tomatoes in this dish made it extra special! Thank you for sharing! I’m glad you like the recipe. I often add a lot more than a little cayenne pepper and yes, I love the grape tomatoes in it and I don’t care if they aren’t traditional. They are so good – especially when you use fresh from the garden tomatoes. Love this recipe! Just made 2 days ago and decided to make again tonight bc I was already craving it!! I’m glad you like it. We sure like it at our house. Thanks for commenting! I’ve lost track of how many times I’ve made this- it’s so good and easy! I like to add other veggies, like carrots, cauliflower or mushrooms. It all depends on what I happen to have on hand. I usually don’t bother with the tomatoes though, I didn’t think they added much flavor. To lighten it up a bit I use chicken breast, one can of lite coconut milk and a cup of chicken broth. It’s actually the first curry dish I’ve ever tried and it’s delicious! Thanks! I’m so glad you like it. Thanks for stopping by and commenting! Thanks for such a nice review! I don’t think of this as a fall recipe, but it is perfect for fall, especially if you have lots of grape tomatoes and zucchini in your garden. I love how the zucchini soaks up the sauce. Thanks for commenting. Thank you for you recipe, I ommited the tomatos and zucinni, I added celery and carrots and diakion radish, to which I sauteed with the onions in until the veg were semi soft. I also used one can of coconut milk. It was the best curry Ive ever made !! Kids really liked it …whew !! I’m so glad you liked it – and thanks for your suggestions of modifications. I’m sure they will be helpful to others! This was made as meal prep for this weeks lunch. It was so yummy I had to eat some for dinner and leave myself one meal short. I used Cauli/Brocolli rice on the side. Thank you for the simple and delicious recipe. Loved it! Thanks. Usually only like one recipe per website, and I have found 3 great ones from you and counting! Thank you so much for sharing! I have Celiac and daughter has gluten intolerance. Paleo seams to work good for us. Great job! – I changed 1 can of cocout milk to light coconut. – added 1 diced red pepper. – use chicken breast instead of thighs. It really is better than restaurants. Great recipe. How nice of you to take the time to comment – and I love your suggestions of changes and I’m sure other people will love to try the changes too. In fact, I may try them myself because my husband is allergic to tomatoes and can’t eat this, so I’ll try it with the red pepper instead of tomato and see what we think. Well, good question. 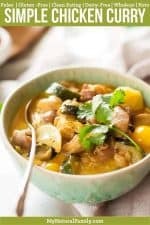 I don’t always eat Paleo nowadays, but I still always use coconut milk in this recipe because I like the flavor of it and because it’s healthy. But I would imagine cream would work too. It’s one of those dishes I’m pretty sure they use coconut milk, even in Indian restaurants though. If you haven’t tried coconut milk, you should give it a try. I hate coconut and love coconut milk. Hi! the nutrition facts, how many ounces are they based on? It shows 8 servings but not how many oz per serving is this based of. Can you clarify? I count one chicken thigh as a serving, which is give or take 3 ounces of meat on average. I’m confused on serving size as well , is it 3 oz total ingredients or just 3 oz of chicken ? also do you slice or cube the tomatoes? Just 3 oz of chicken. I usually use grape tomatoes and cut them in half. Hello! Are you able to tell me how many servings this makes ? If you look right above the ingredients, there are orange boxes. In one of the orange boxes, one of the boxes says servings. This recipe has 8 servings. If you want to change the servings so it more accurately reflects how your family eats, hover over it and you can change the number of servings and the nutrition information will change automatically. Thanks for the recipe. I used chicken thighs and left the tomatoes out, and it tasted great. Next time I will try with the breast, which I like more. Yes. Chicken breast would work just fine and would take longer to cook. I actually think most Indian restaurant use chicken breasts anyway. I just like thighs because I can cook them for a long time and they won’t dry out and I like the flavor of the thighs. Thanks for the suggestions of modifications. Hopefully other people will find it useful! Can this reciepe be made in bulk for a weeks worth of dinners and still be good for a week? I have eaten this a leftover for about a week. You should be good to do this I would think. Looks like a fantastic weeknight go-to. I made this for dinner last night and I loved it! My husband liked it, but he thought that the tomatoes were gross. And while I like tomatoes, I felt like they were weird in this dish. I will leave them out the next time I make this. I know it is a paleo dish, but it would go awesome over rice or quinoa! My husband also thought that the broth was kind of weird, he said it wasn’t like soup or a sauce, so I think next time I’ll make one of the cans light coconut milk and see if that helps. Thank you for your comment, I am glad you liked it overall. I always heard that olive oil should not be heated high. That’s true. We’ve actually started using avocado oil for most of our cooking now because it has a really high smoking point. Will definitely add this one to the book of keepers. I know. Isn’t it so good? All my children love it. I’ve started finishing it off in the oven instead of simmering it on the stove. It gets that good roasted flavor and it doesn’t take as much attention either. Just happens that it is back on the menu tonight, maybe I will give the oven idea a go. This looks so good! I love the taste of curry! Adding this one to the menu! 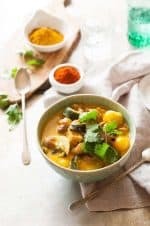 This soup looks amazing and between the warmth of the soup and the heat from the curry, I bet it’s great comfort food for winter weather. Now this seems amazing. I must try it! I like the addition of the grape tomatoes. Very yummy. I LOVE a good curry, thank you for sharing! Thanks for commenting and please let me know if you like it. Good idea. Not Indian, but a good way to get more vegetable, and it’s not like it’s all that authentic anyway. I made this tonight and my 2 picky eaters loved it! I forgot to add the tomatoes, but they don’t like tomatoes anyway. I only used half the salt, thought it was bland, and ended up adding more at the table and it really tasted amazing. Next time I’ll follow the recipe and use the full amount of salt. This is definitely a keeper recipe!!! That’s funny you forgot the tomatoes. I forget them a lot or don’t have them and I still love it. My pickiest eater loves this curry. This looks great! Pinned for later! I needed a meal in a pinch and this recipe was recommended to me. It came out great and my whole family loved it! Thanks! So good to hear from you and I’m glad people are recommending my recipes. I’m flattered! Starting a Paleo/Low Carb diet. Will definitely have to try this one. We love curry and know it is good for you! I have made this dish several times now. So easy and so delicious! My kids love it too! So good to hear! It’s definitely a staple here. Thanks for your nice comment too! I love spicy foods and this looks wonderful. Sorry about the instructions. I’m terrible about measuring things and like to changes things up a lot and a lot of it is personal preference. For coconut milk I usually do one can, tomatoes about half a cup, 1-2 zucchinis depending on size and I also really like half zucchini, half summer squash. For coconut oil it’s just enough for the bottom of the pan so the seasonings are all wet and the chicken doesn’t stick. Thanks so much… Can’t wait to try it! Oh, I’m so glad! I’ve made it so many times and LOVE it but it’s hard to know if others will love it too. It’s my default when I need something quick but tasty and satisfying. Chicken curry is my favorite dish. This looks yummy – can’t wait to try it! Hi Rebecca – I found you over at DIY Home Sweet Home. This recipe looks amazing and I love that it doesn’t have many carbs. Printed for my recipe book. It really is a popular recipe of mine that I make often. In fact, I made it tonight. I was in the mood for something spicy so I put tons of spices on it, including extra cayenne. It was nice and spicy and it’s burning in my tummy right now. I love that feeling!